Another good day for gold bulls yesterday, as the spot gold price bounced higher during the trading session once again, and ended the day with a wide spread up bar which closed well above all three moving averages, and regained much of the lost ground of the last two days. This move higher came as no great surprise following the hammer candle of Monday, and as I suggested in my spot gold price market commentary of the 22nd September, this was likely to happen, and the move higher has simply validated the hammer candle as a result. Indeed with yesterday’s candle finding strong support from both the 9 day and 14 day moving averages the bullish momentum remains firmly in place on the daily gold chart. The key for today will be whether the spot gold price is able to break above the current minor resistance level now in place at the $1025 per ounce where the recent pullback occurred, and much of course will depend on the fundamental picture today, with all the markets waiting nervously for the FOMC interest rate decision and accompanying statement which will no doubt set the tone for the US dollar and equity markets as a whole. With the recent breakout no firmly established and with the strong upwards trend fully supported technically, there is no reason to suppose that the bullish momentum will be broken, particularly following yesterday’s strong move higher, but should the FED surprise the market in any way, then this will almost certainly add some further volatility to the the spot gold price market late today. 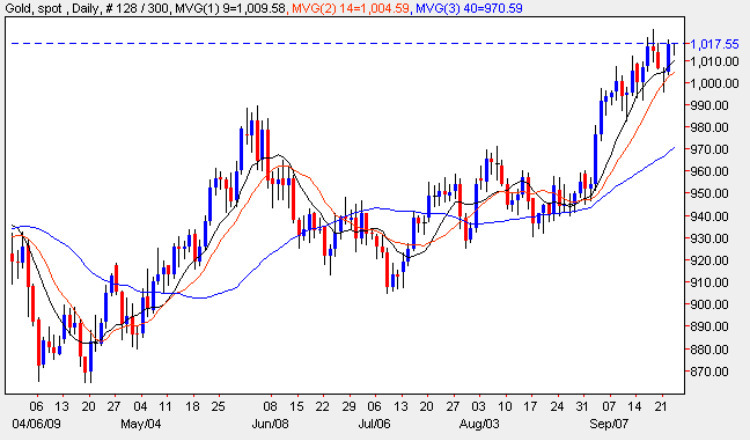 The short term outlook for the spot gold price is bullish, the medium term is sideways and the long term is bullish.